I am a gigantic fan of to-do lists. I love the enjoyment that comes with checking that box or drawing that line. Early in my career, I had an amazing manager who picked apart how I managed my to-do list. And rightfully so, because mine had some major shortcomings. Her productivity system became my system, and I’ve used it ever since. In my career, I’ve come to realize it’s not the to-do list itself that gets stuff done. It’s the process that surrounds the to-do list. With that in mind, I want to share my system with you. I’ll start with the pen-and-paper version I used early on. Then I’ll describe the digital version (because, as you can guess, it is more efficient than paper)—which I use entirely from my iPhone and my Mac. This was the system I used for a major portion of my career, until the past few years. There are four steps that make this productivity system work. On Mondays, I would create an individual page in my notebook for each day of the coming week—Monday through Friday. I’d write the day and date at the top of each page, then create empty checkboxes for my tasks. After each meeting, I’d review my notes, pull out action items, then assign each one to a day. This is a critical step. I didn’t just put all the tasks on Monday. There was no way I could realistically get them done that day. Instead, I prioritized and scheduled them based on their due date, importance and my availability. Once I had a daily to-do list assembled, I’d look it over and estimate how much time I thought each task would take. I’d write the times next to the tasks, add up the total hours needed to complete them, then look at how many meetings I had scheduled on that particular day. It was often a sobering exercise. If I had 15 hours of tasks and meetings on my list for the day, I’d move the lower priority items to later days—when I had more availability. If I didn’t get to a task on the assigned day, I’d move it to the next day. That kept tasks from getting lost or forgotten. It’s a simple process, but it’s powerful. It helps me get things done—on time—without letting things slip through the cracks. I used my pen-and-paper system for years, and I loved it. But as time went on, I started to feel embarrassed carrying my notebook around, especially as everyone became more reliant (addicted?) to their phones, myself included. Apps can do also do things you just can’t do with a pen and paper. For example, I couldn’t search to find that one idea I knew I’d written down in a meeting two months ago. But a digital note-taking app can find a note like that with a simple search. For years, I tested a bunch of productivity apps and web-based to-do lists, but I couldn’t find anything that worked for me. 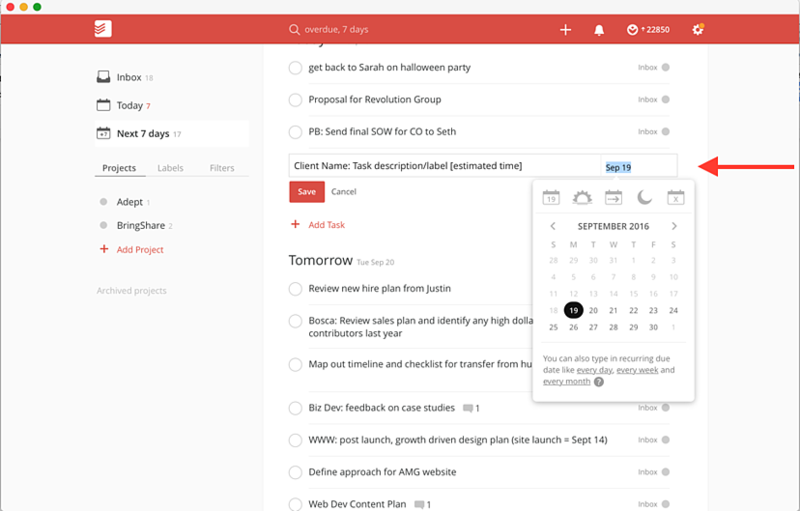 Then I found Todoist, which—combined with Evernote—was the perfect app for my system. Todoist is a fantastic app. It has apps for Mac and iOS (the ones I care about), plus Android, Windows, and others. There’s even a Chrome extension. 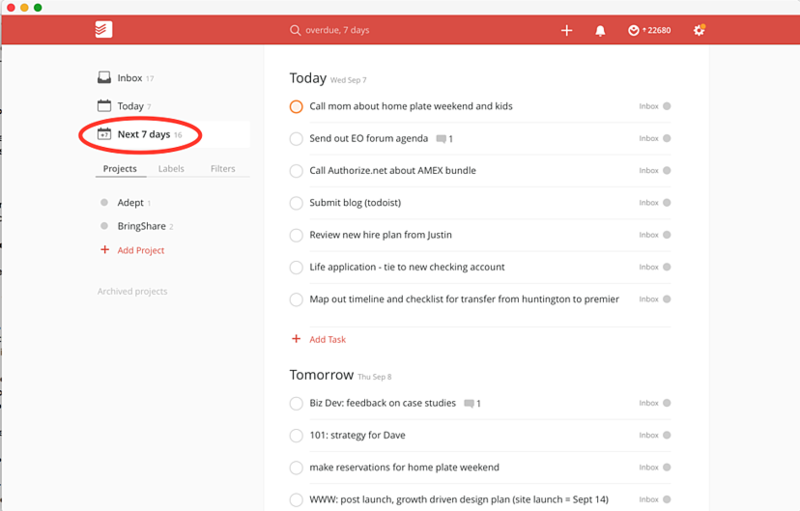 Todoist syncs beautifully and instantly. When I make a change on my Mac, it shows up on my phone within moments. It’s easy to make tasks, assign due dates, drag and drop tasks to different days, and prioritize tasks for a given day. Evernote is equally awesome. As you’ll see, it keeps everything right where I need it. If my new task is related to a client or a bigger project, I’ll note this in the task name. Some people I’ve trained on my system like to add a label (I feel like it’s an unnecessary extra step, but that’s me). I add the task’s estimated time into the task description as well. 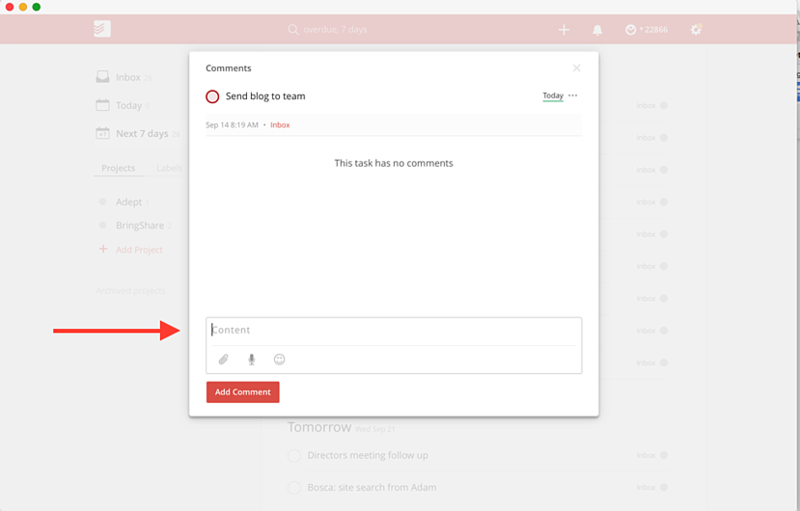 If necessary, I will add more details to the task by using the commenting feature. While I’d love to say my system always allows me to get to every task on a given day, sometimes that doesn’t happen. If I don’t get to a task, I can easily reschedule it by dragging it to the next day or a later date. 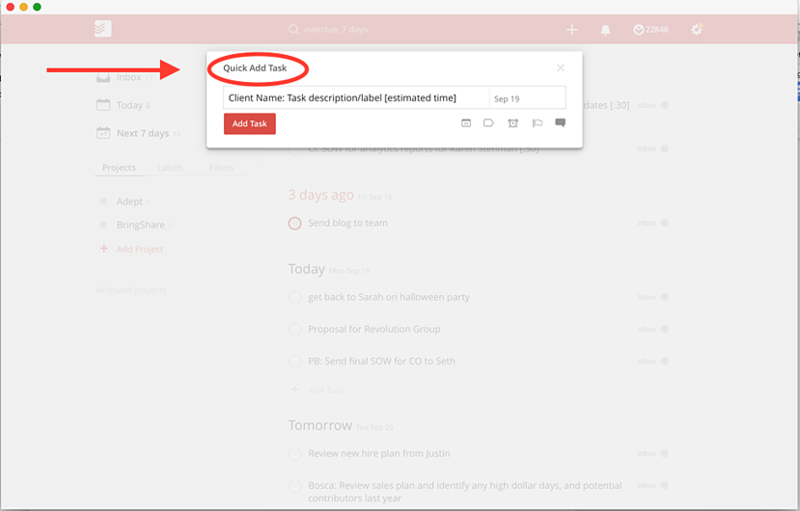 Todoist makes it very easy to reschedule tasks this way (unlike the pen-and-paper system). Todoist’s “Next 7 days” view is where I live. It lets me easily see the full week at a glance. For this system to work, one should never work from the “Today” view only. 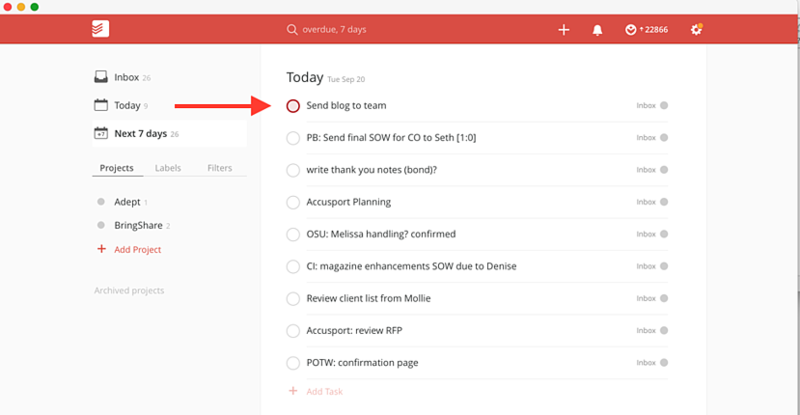 Todoist has lots of other features too—such as creating tasks from emails, setting reminders, etc. I don’t use them, but they might be great to add in. Todoist goes a little further than my notebook ever could. They tap into my competitive streak, which I love. As you use Todoist, they assign you karma points based on your productivity. Right now, I have over 22,000 karma points, placing me in the top 5% of productive users. I don’t really know or care what that means, but I do really like being in the top 5%. You can also see your productivity levels for the week, which makes me feel like a rock star—assuming I’ve had a productive week. And most of all, I LOVE when I get a little note saying I’m at Todoist Zero for the day and to have a good day. When you’re to-do list says “well-done and good night”? Yeah, that’s an awesome feeling. Like my to-do lists, my meeting notes have also migrated from paper to the cloud. For this, I use Evernote. I don’t bother organizing my Evernote notes. They’re all just in one big notebook. When I go to a meeting, I open a new note for that meeting. I take notes, and that’s it. After the meeting, I review my notes, then transfer action items into Todoist, just like I used to with my old paper system. If I need to store a few random thoughts about a project, those go in Evernote too. If I need to review my notes from a previous meeting, I rely on the search box to find what I’m looking for. You need an effective, reliable productivity system. Because being a professional means delivering your work on-time—without letting things fall through the cracks. If you don’t have a good productivity system, I strongly suggest you steal mine! It’s served me beautifully for many years, and I believe it will serve you well too.